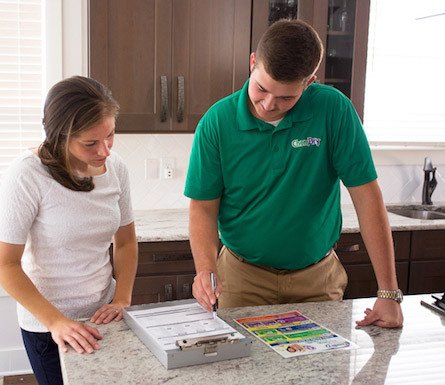 Since 1994 Chem-Dry of Chapel Hill-Durham has been proudly serving our Durham and Orange Counties, including Durham, Chapel Hill, Hillsborough, Mebane, Research Triangle Park, and Pittsboro communities by helping our customers maintain a clean, healthy, happy home. Our advantage in customer service satisfaction is technician experience. Our average technician experience is 14 years--very rare in the home service industry, or any other industry. One reason for our unusually high level of experience is the large job satisfaction we get from the wonderful results and satisfied customers. Our technicians think of their job as a career, not as a temporary way to pay bills. Another reason for our customer satisfaction and large repeat business is owing to our franchises' proprietary low water, hot carbonating, deep clean extraction process combined with our non-toxic, exclusively green-certified solution. The result leaves your home not only cleaner but safer and healthier, too. Chem-Dry of Chapel Hill-Durham is a locally owned and operated international franchise. Be aware that there are other Chem-Dry franchises, but only one is named Chem-Dry of Chapel Hill-Durham. We provide superior carpet and upholstery cleaning, in-home oriental rug cleaning, and tile/grout cleaning. Our most famous product may be the pet urine treatment. Chem-Dry's patented pet urine treatment is amazing--the best in the business; the treatment breaks down the urine and makes it go away. When you receive a coupon in the mail offering carpet cleaning services, please read the fine print. In many cases these coupons advertise the old, less effective Chem-Dry method, which we have never used. Additionally, your final cost by using these coupons may be significantly higher than our fair, daily prices. At Chem-Dry of Chapel Hill-Durham, we provide professional carpet cleaning & upholstery cleaning and tile/grout cleaning Durham, Chapel Hill, Hillsborough, Mebane, and Pittsboro. Our mission is to serve our customers every day by helping them maintain a clean, healthy, happy home. Our proprietary Hot Carbonating Extraction cleaning process uses the cleaning power of carbonation to lift and extract dirt and grime from your carpet and upholstery fiber, delivering a superior cleaning while using 90% less water than traditional steam cleaning. Since we use less water, your carpet dries in 1-2 hours, so there won't be a musty smell once your carpet dries. Our professionally-trained technicians here at Chem-Dry of Chapel Hill-Durham are dedicated to providing an outstanding cleaning experience and will treat your home and family with the respect you deserve. For the Burlington area you may also contact Chem-Dry of Burlington, chem-dry.net/burlington.nc . For the Cary, Apex, and surrounding areas you may also contact Chem-Dry of Cary, chem-dry.net/cary.nc . We don't want to just make your home cleaner, we want to actually make it healthier. That is why we use non-toxic, green-certified cleaning solutions and less water. Our primary cleaning solution, The Natural®, uses only ingredients that are on the F.D.A. 's Generally Recognized As Safe (G.R.A.S.) list. The Natural® is also green-certified and 100% non-toxic so it is safe for your kids and pets. Our cleaning process also allows us to deliver a superior cleaning while using 90% less water than traditional steam cleaning. Because we use less water your carpets dry in 1-2 hours, not 1-2 days. Plus, no gross mildew smell after the carpet dries. We use a patented cleaning solution called The Natural® which is green-certified and 100% non-toxic, so it is safe for your children and pets. The Natural® cleans without the use of harmful soaps and detergents which can leave a sticky, dirt-attracting residue behind. 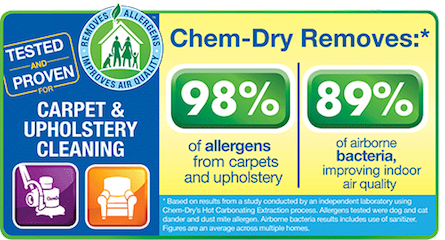 You can trust that when you choose Chem-Dry of Cary to clean your home, that your home will stay cleaner longer. 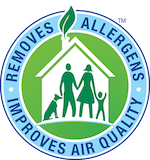 Our proprietary cleaning process combined with our non-toxic, green-certified solution means that we'll leave your home not only cleaner but safer and healthier, too. Our professionally-trained technicians here at Chem-Dry of Chapel Hill-Durham are dedicated to providing an outstanding cleaning experience and will treat your home and family with the respect you deserve. Just ask our long-time, satisfied customers at IHOP of Burlington, Durham Upholstery, and Trinity Worship Center. Durham, Chapel Hill, Mebane, Research Triangle Park, Pittsboro.